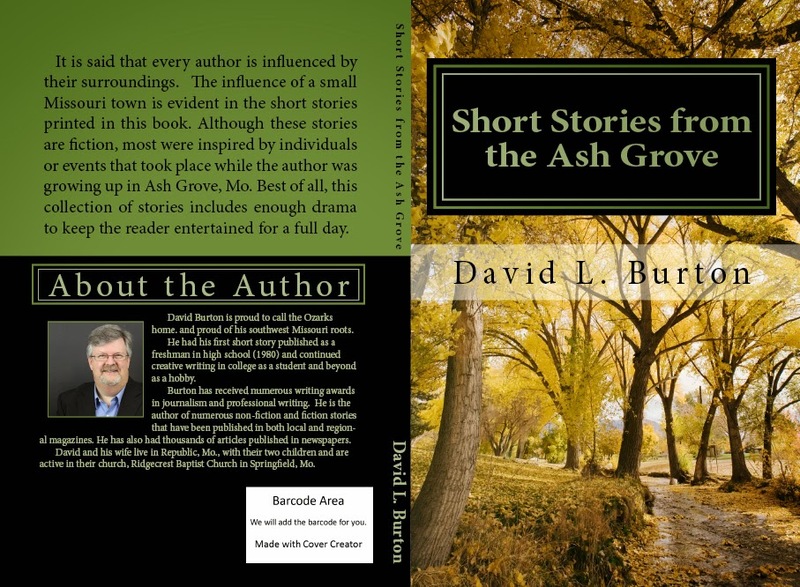 Big Daddy's Ozarks Writing Blog: Author Q&A About "Short Stories from the Ash Grove." Author Q&A About "Short Stories from the Ash Grove." My new book, "Short Stories from the Ash Grove" is available for sale online. As a result, I'm getting lots of questions about the book itself. This blog entry share some of the Q&A that I've had over the past week. Q: How was writing this book different from your previous works? A: My other books are all non-fiction. This is my first fiction book, although many of the events that come up in the book and the stories that get told from my life are true. The other difference is that this book has been 30 years in the making. I’ve written many short stories over the years for high school and college courses but also for entry in the yearly contest conducted by the Springfield Writer’s Guild. In fact I’m working on a short story right now for that contest. I have probably 12 short stories that I have written that are not in this book because they didn’t fit with the theme. The whole idea came to me when a high school classmate asked me two years ago if I still had a copy of the short story I wrote and read to our Senior English class back in 1984. She was wanting a copy to read again. Not only did I have that story but I had others as well and made me start thinking about creating some sort of collection. Q: Do you have plans to do a follow up or sequel of sorts to this? I am sure someone who has called this area home for a long, long time would have many more stories to write about and/or share. A: I have four stories outlined on paper that I would like to someday turn in to novels. I have the first chapters written for two of them. Those novels might begin as short stories. All four of them would be fiction but each one is centered around factual events that happened around Ash Grove. One focuses on family life and events taking place in and around a one-room school south of Ash Grove, for example. This past year by wife gave me a writing retreat for a Christmas gift to finish my collection of short stories. If she does that again (hint, hint) I would probably get started on one of these other novels. At some point, I would like to shop some of my story ideas to national publishers and one or two of these novels might work. Q: When did it officially come out online/for publishing/bookshelves? A: I think the proof was approved on July 7, 2014 and made available online the next day. In finished the text back in April. This has been a three month process or so with some vetting and editing of the book by others and two rewrites by me before the book was finalized. The book is available for purchase on Amazon.com and Createspace.com. It is also available to libraries and bookstores through Amazon’s wholesale program. But bookstores have to make the decision to stock it and there is a lot involved in that process and honestly, the process doesn’t favor small, local writers. Q: What has the response and feedback been thus far? A: I’ve had a favorable response online and I would hope readers enjoy it. Some of it is personal but there is certainly nothing in it that is negative toward Ash Grove or my experience of growing up there. Right now it looks like I’ve sold about 320 copies. I assure you, I don’t get rich off the sale of the book but 320 was enough to move my book up in the online sales rankings making it the 100,032 most popular book on Amazon! My goal was to finish the book so it can now be available for many years. I’ll see what happens in the future. Q: Did you use real names in this book? I fictionalized all of the names in all but two of the stories. Some might say the names were changed to protect the innocent. The names of the guilty I kept. But honestly, this isn't a "tell all" type of book The writing style and story types vary widely and it is met to be a fun escape. Q: And what did you enjoy most about writing this book? A: Parts of the book were a trip down memory lane. Good memories. I find story writing to be relaxing. But I think it can also be a calling. These stories were an opportunity to share about life and share some bigger thoughts about life in general. My favorite short story author, O. Henry, wrote about what he knew best: cowboys, the big city, and newspaper work. Likewise, I find myself writing about things that I know best: small town experiences, newspapers, church, and events in my own life. My hope is that readers enjoy this glimpse at life in Ash Grove from the perspective of one person.